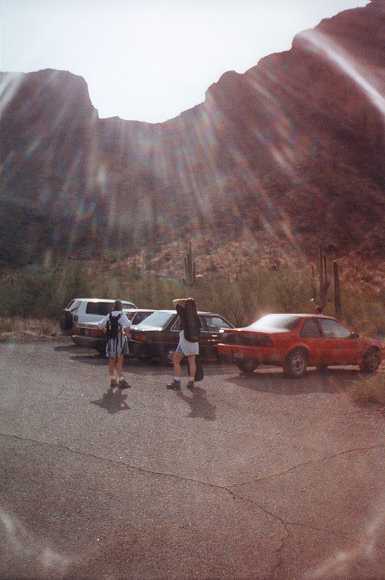 Picacho Peak lies about halfway between Phoenix and Tucson along Interstate 10. Its sharp peak is unmistakable in the desert skyline. The product of a volcanic eruption thousands of years ago, Picacho offers an interesting look (especially from its peak) at the otherwise flat surroundings. You can actually still see the dark ring of lava flow around the base of the mountain. 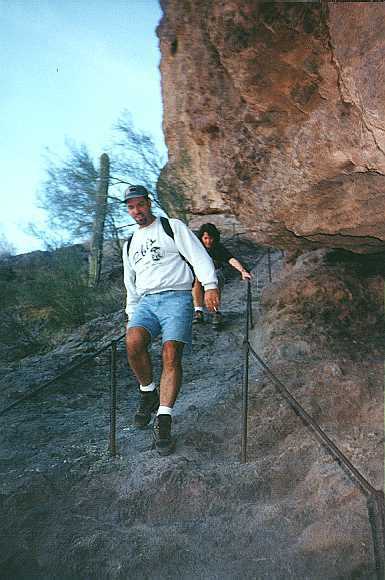 The hike itself is fairly challenging with a vertical rise of about 1,500 feet in 2 miles. 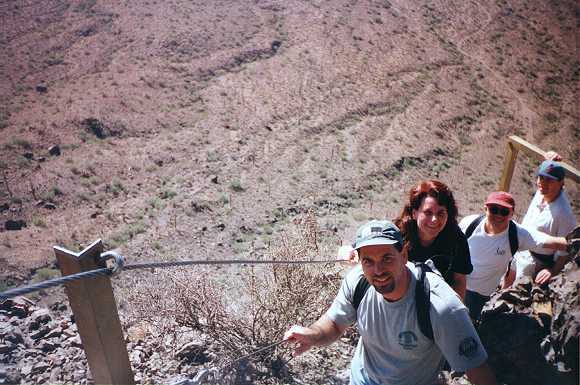 The features that make it challenging are several short sections of steep inclines where the assistance of steel cables are necessary to advance, a narrow passage or two near the top where you are walking on wooden planks suspended in mid-air by ancient-looking steel anchors, and a long descent midway through the hike that takes you back down the hill a few hundred feet before the trail climbs back up again. So in actuality you are getting about 1,700 - 1,800 feet of vertical workout. In the early spring, Picacho Peak State Park and its surrounding areas also offer some of the best wildflower displays in Arizona. This year, there were millions of gold poppies, purple lupin, and yellow brittlebush all around the base of the mountain. Gorgeous! The group gets ready to tackle the peak. The glaring sun shines down on us through the saddle point of the peak. The group takes a brief rest in the shade before advancing. From top down, we have Doug, Annette, Glenn and Patty. Glenn and Patty descend down the drop-off. I know what you're thinking Glenn... "Whose crazy idea was this anyway?" 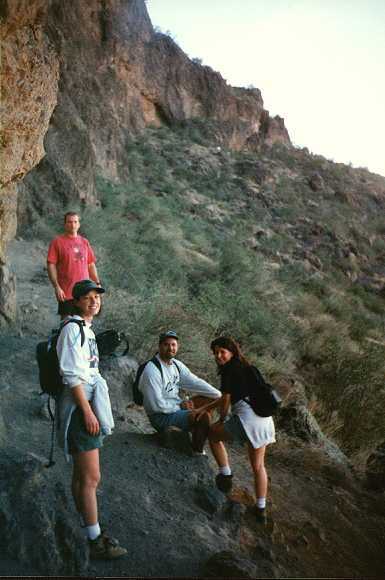 Glenn, Patty, me, and John climb up one of the narrow passages near the top. The ancient lava flow around the base of the mountain is visible in the background. 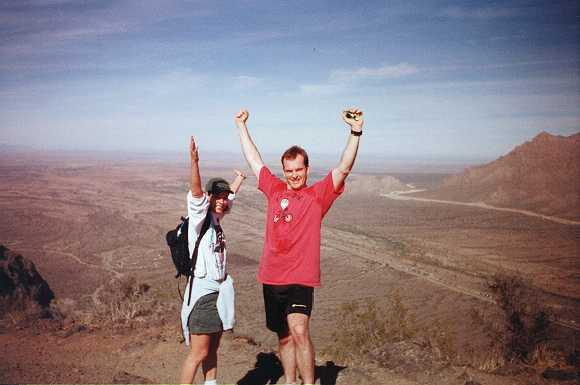 Annette and Doug doing the victory pose at the peak. The obligatory group photo at the top. 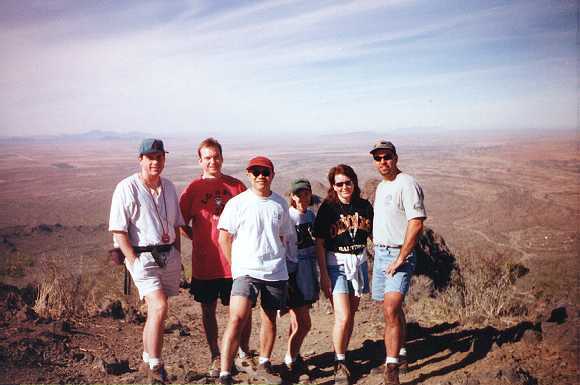 From left to right, we have John, Doug, me, Annette, Patty, and Glenn. 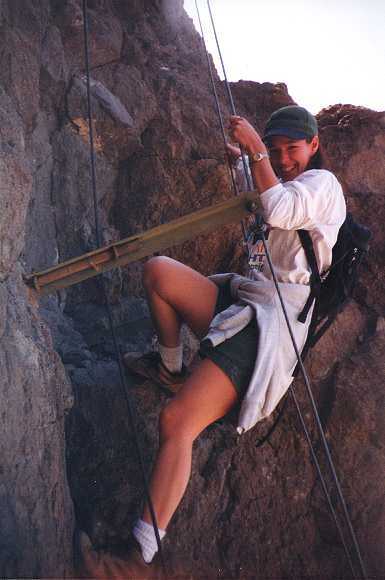 Here's a cute picture of Annette as she climbs down the steepest part of the hike. Finally, the point of the whole hike, the reason we came to Picacho Peak ... ice cream!!! 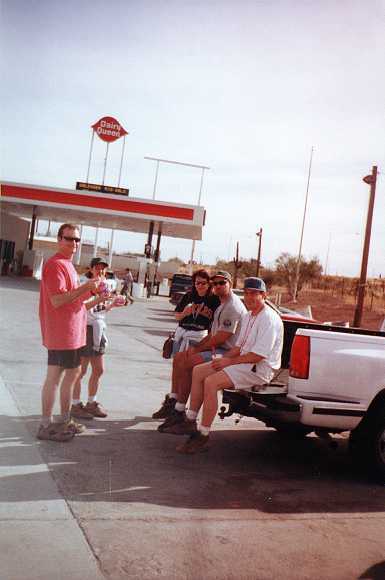 The group rewards itself at the truck stop across the street.